How can a story about the purposeful murder of 650,000 people be wonderful? 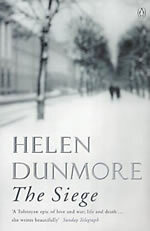 When the story of a few survivors is so poetically and lovingly told, as in The Siege by Helen Dunmore. Leningrad has reverted to its original name, St. Petersburg. This former capital of imperial Russia is on the Baltic Sea and is, therefore, neighbor and accessible by sea to many capital cities: Helsinki, Tallinn, Riga, Copenhagen, Stockholm. Because it is mostly a city of islands, as is Stockholm, Leningrad was isolated from the rest of the Soviet Union by the Nazis’ control or destruction of its bridges. But, back to the book. Not only are we given a prose poem, in my opinion, but also a close look at the institutional paranoia of the Soviet era. The main character of the story is in constant fear of not pleasing her bureaucratic superior and in seeming not with the current politically correct thinking and behaving, as all Soviet citizens were subject to. A small but important picture is given of the government official in charge of the food supply for the starving residents of Leningrad. One of his ukases was to inform the people of the nutritional value of wallpaper paste. The will to survive, the willing sacrifice for those who should survive, the terrible ambitions of leaders feeling God-like powers, all are explored here. This entry was posted in History, War & Peace and tagged Baltic Sea, Battle of Moscow, Helen Dunmore, Leningrad, Nazi invasion of Soviet Union, Operation Barbarossa, Saint Petersburg, siege of Leningrad, Soviet Union, St. Petersburg Russia. Bookmark the permalink.